On Monday this week, my father died. That’s the easy sentence to write. Now what do I say? I can say that in some deaths, grief so out-powers gratitude of any kind, the latter cannot be found until much later. In this one, there’s also grief, but gratitude rises more quickly to the surface — because my dad was a good man, because he lived a long life (88 years and 8 months), and because his last years were ravaged by Alzheimer’s disease (and I use the word “ravage” intentionally with all the meaning it holds: “to work havoc upon, to do ruinous damage”) and so we’d already been grieving slowly and subtly and I trust it won’t be surprising to hear that we’re relieved the suffering of that illness is over. I’m also grateful I could be at his side when he died. Although Dad had been declining physically as well as mentally, that decline had accelerated in the past weeks. When we left for our Christmas holiday travel, I said good-bye as if I’d not see him alive again. By Christmas Day, he was expected to die before the day was out, but when we returned on the 26th, he was still breathing. He lived a further two days. The staff at the care facility marvelled: such a palpable shutting down, no responsiveness, and yet his heart kept beating. We who knew him were less surprised. Not only had he always been strong and athletic, but this persistence was symptomatic of his temperament. He had a stubborn determination about him; he was not a quitter. Whatever he’d committed to, whether it was his commitment to Jesus Christ at age 14 or his commitment to our mother more than 62 years ago, it lasted by virtue of diligent going-on with it, one hour after the other. Our last vigil at my father’s side was as much listening as watching. When life is so reduced, one only notices what’s left. In this case, it was his breathing. The day before his death, Dad would stop breathing for up to 30 or 40 seconds at a time, then resume a further round of it. The day of his death, another pattern ensued, with very few pauses but the breathing faster and shallower and noisier. While we waited and listened, my mother and whoever else was there passed the time talking, singing, reading. We often stroked Dad’s forehead or held a hand. 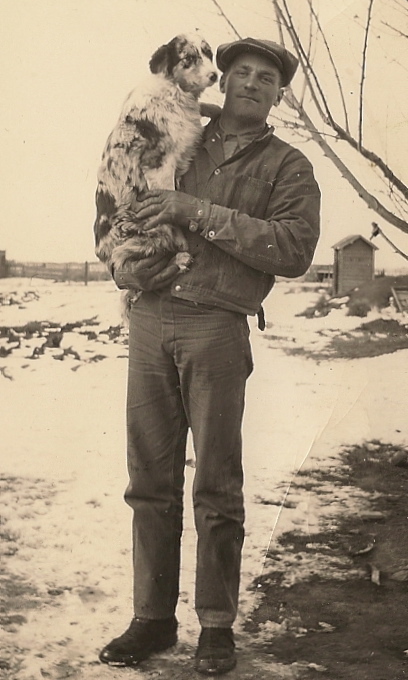 Sometimes I found myself glancing from the black and white photograph on the wall, of my father as a lean young man, holding his dog Curly, to the shrunken body, mouth slack, eyes half open but seeing nothing. In his last hour, his extremities already cool and purplish, the eyes now open completely though still not seeing us (though “seeing” the unseen eternal, as per 2 Corinthians 4:18, perhaps), his breaths became very quiet and scarcely deeper than his throat. Then, each one quieter and shallower, they stopped. This entry was posted in Death, Personal and tagged breathing, Death, gratitude, grief by doradueck. Bookmark the permalink. Your sorrow, relief, and gratitude, beautifully expressed, are so understandable. Your words took me back a year to the night of holding my grandma’s arm–watching her breaths, calling out blessings, and feeling for her last pulse–at once frightening and beautiful. Losing my last grandparent felt like a support beam in my interior life had fallen, exposing me to the elements; I imagine that losing a parent would feel more-so. Thank you for sharing your admiration, photo, and memories of your father. I pray comfort and community surround you. May you know God’s presence and peace in a new and deeper way as you go through this time of grief and gratitude. It’s wonderful to have the heritage of your dad’s deep commitment to God and his family. You, too have that quiet persistent spirit which I know your father role-modeled for your family. It brings tears to my eyes when I remember his gentleness to me in our growing up years. You will miss him greatly. With my own Dad it comes in waves. Hugs across the “wire” to you, Helmut, and your mom. Thank you, Angeline, Leona, Eunice, for your words and your stories. @ Angeline: “a support beam in my interior life” — what a wonderful image/goal for a grandparent. @ Leona: I’m touched by the metaphor of birthing, and my deepest thanks for your lighting a candle in my father’s memory. @ Eunice: my longest friend, thanks for your memories of a much younger Dad (and reminding me of yours). One of the “benefits” of a funeral and taking the time to share stories and look back is that it restored to me some sense of that earlier person, whom I’d lost sight of these last years when he was so weakened, and also sometimes aggressive, in the PCH.